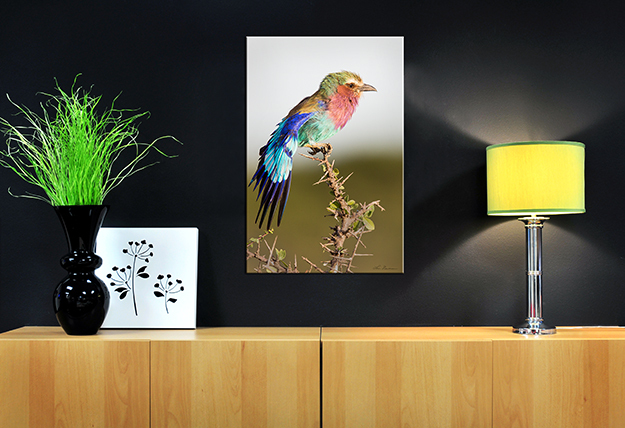 "Wing Stretch" 24x36 Thick Gallery Wrap © Lou Newman Lilac-breasted Roller, Tanzania, East Africa, 2013. My lens mount was resting on a bean bag on the roof of a Toyota Land Rover and I was concentrating on the bird, hoping to get a flight shot when it did this fantastic wing stretch. The image was taken with the Canon 1DX camera and Canon 600mm f/4 IS II lens. The settings were: ISO 400, f/5.0, 1/1000 second in aperture priority. I developed a curiosity about photographic techniques as a teenager which evolved into a lifelong calling. Photography was a significant activity throughout my years as a rancher and veterinarian in Montana, and became of major importance when I left practice to become a veterinary college faculty member and pursue an advanced degree. Photography was important in my roles as professor, pathologist, diagnostician, research clinician and administrator. During the 1990's I prepared for a photographic "career in retirement" and the change to digital imaging. Large animal medicine/surgery and wildlife studies had always been major interests and reinforced the progression to wildlife photography. My passion is photographing wildlife and birds of the Florida coast. Arthur Morris (Birds As Art) has been a major influence and source of encouragement since 2002. 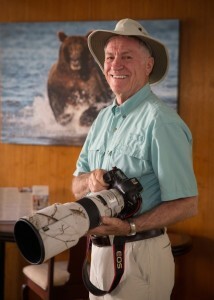 I have travelled with him on several of his instructional photo tours and find him an inspiring teacher. Following retirement in 2000 I volunteered as a veterinary pathologist at Mote Marine Laboratory, as a veterinary surgeon at the former Pelican Man Bird Sanctuary and as an Emergency Veterinary Medical Officer in Great Britain during the Foot and Mouth Disease outbreak. I taught digital imaging classes and photography lectures on cruise ships. Through these endeavors I found that I really enjoyed sharing my images with others, but did not enjoy the time I spent "marketing." Providing images for exhibits in hospitals, healthcare centers, retirement communities and nursing homes has become my niche. Canvas provides a terrific display medium for my wildlife images. Canvas images tend to sell themselves; large canvas gallery wraps have become one of my main sources of sales. I commented to another photographer that I was unhappy with the canvas gallery wraps I purchased elsewhere. He referred me to Artistic Photo Canvas and APC has been my "go to" company for all of my canvas needs ever since. I'm exceptionally pleased with the matte canvas prints for my wildlife images; the frames used by APC are second to none. 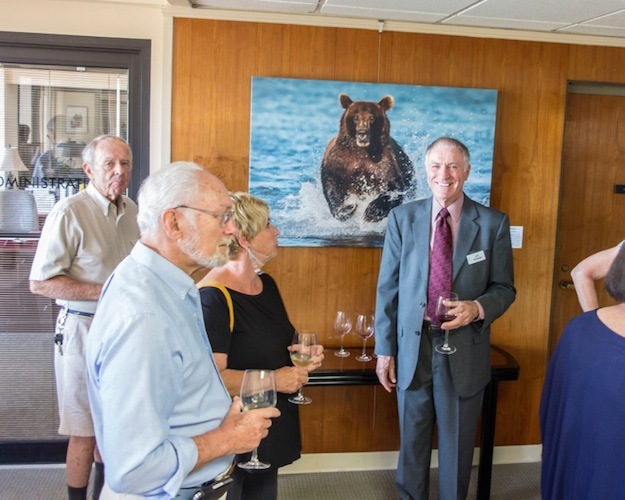 Nature photographer Lou Newman greets guests at a recent exhibition of his work.